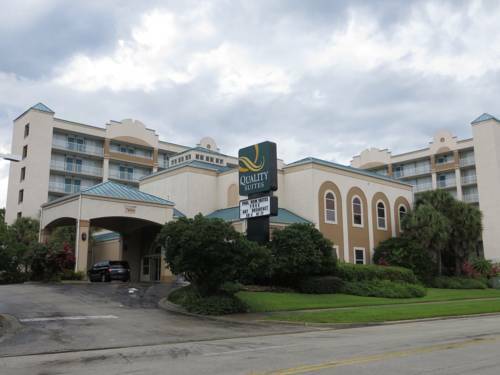 Conveniently located one block off the world-famous International Drive, the Quality Suites Near Orange County Convention Center hotel in Orlando gives you more for your hard-earned money. We offer easy access to restaurants that fit every budget, as well as major theme parks and attractions, like SeaWorld of Orlando, Discovery Cove, Titanic the Experience, Universal Orlando and the Orlando Eye. Amenities include free hot breakfast, free WiFi, free parking and an outdoor pool and hot tub. All guest rooms offer a pool view. We feature two-room suites that feature a parlor and separate bedroom. Earn rewards with every stay with our Choice Privileges Rewards program. Hotel fee of 2.50 USD per room, per day. No Pets Allowed.